Layne is an enthusiastic baker and loves to share her tips, tricks, and baking shortcuts. Her favorite pie is ollalieberry. 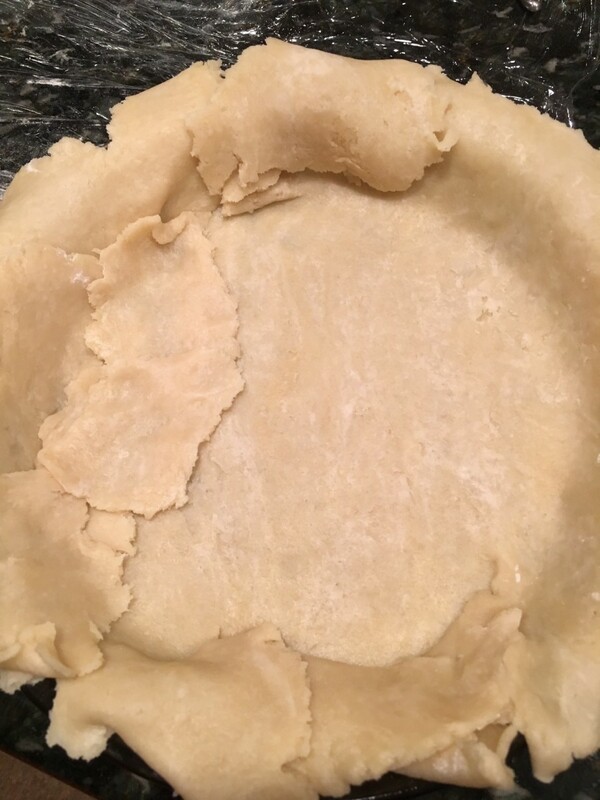 Why Is My Pie Crust Not Sticking Together? 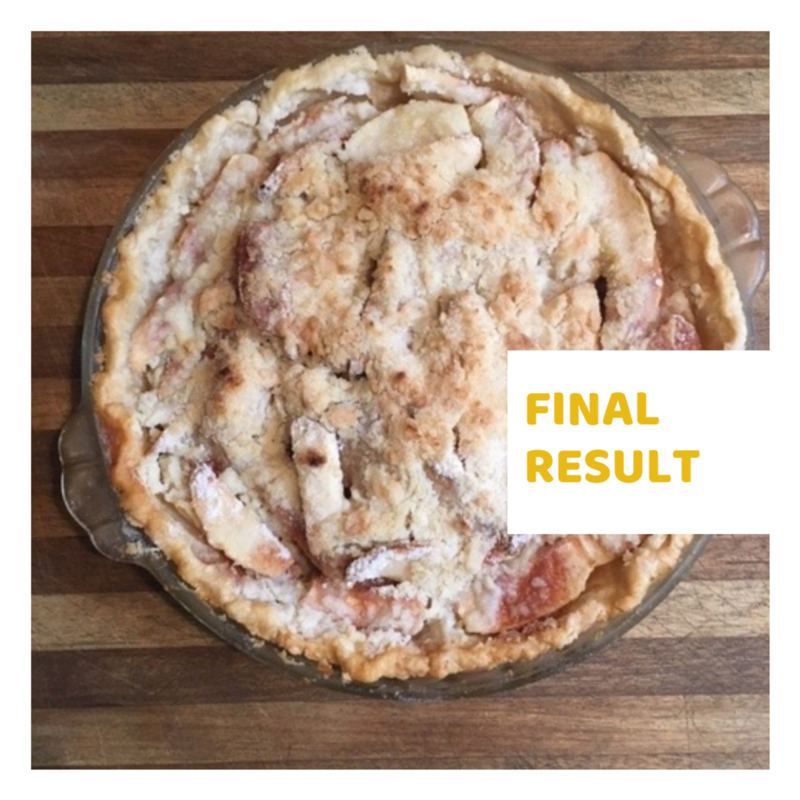 So, let's say you followed your favorite pie crust recipe directly as stated, line-by-line. 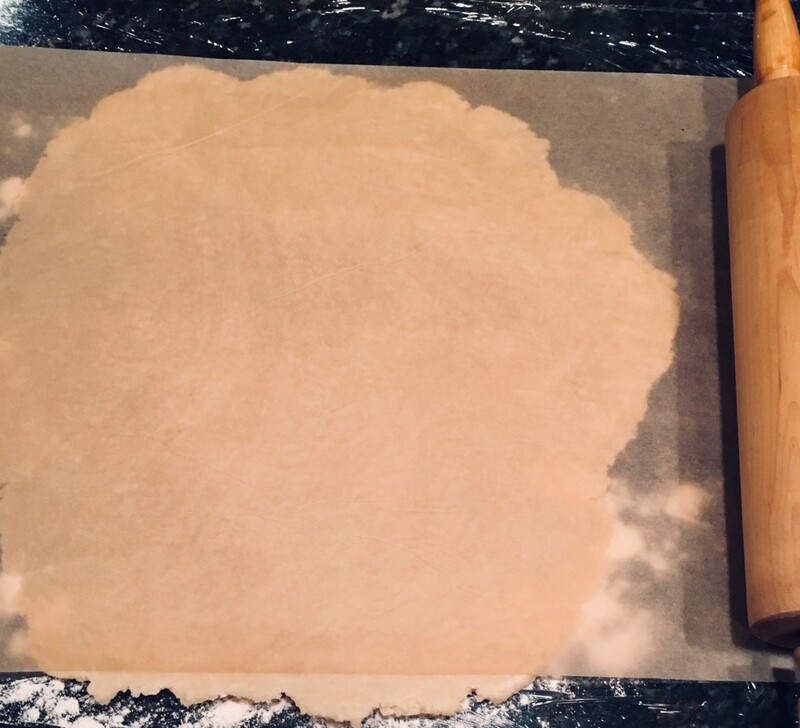 When it comes time to rolling out the pie dough, you find that it is either too wet, too sticky, or too dry. You've tried various techniques to fix it, and the more you work the dough, the worse the problem gets. 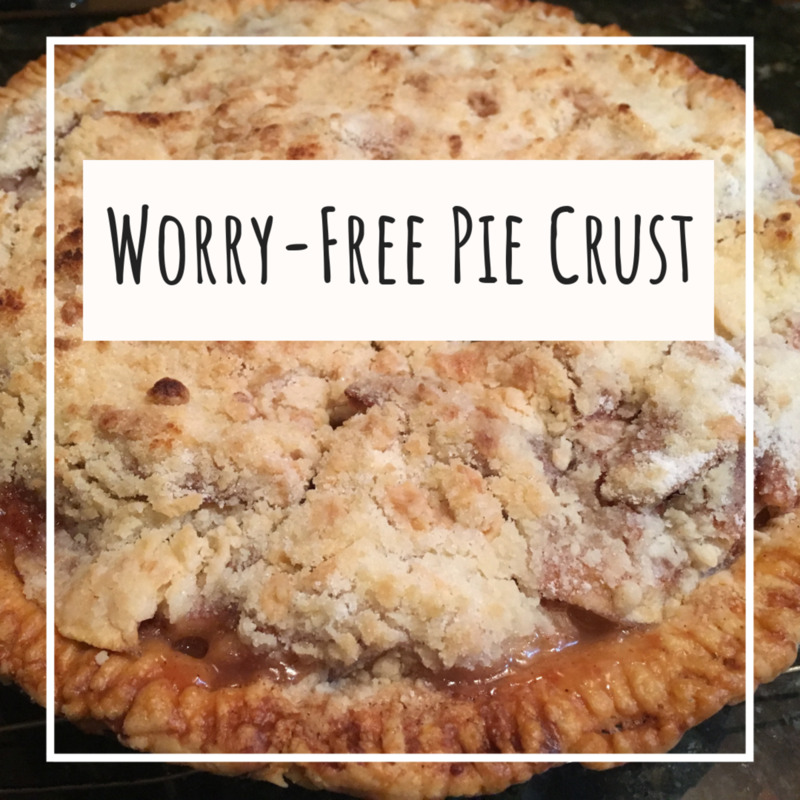 The good news is that you CAN get good pie crust even if the dough won't stick together, so long as you've ruled out missing ingredients. What Is the Secret to Great Pie Crust? 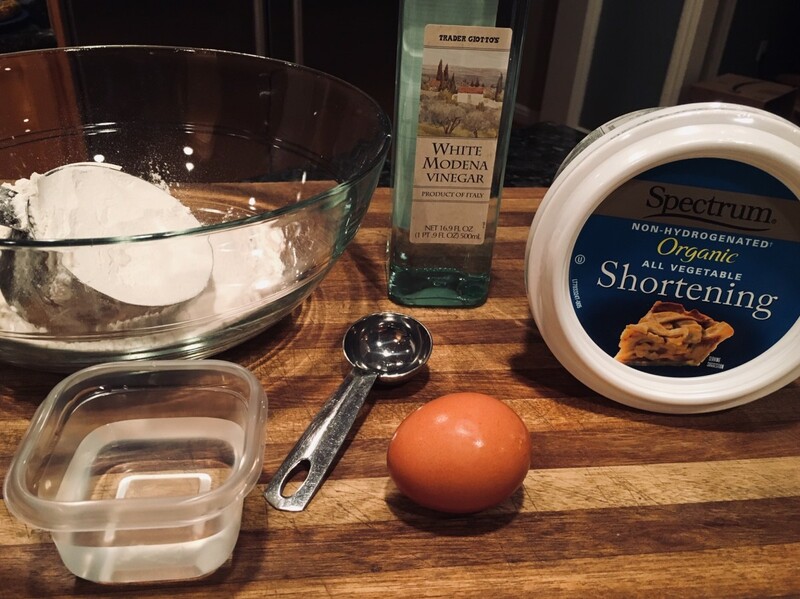 There are many great tips from seasoned bakers—I've made butter crusts, used vodka, used weights, etc., but I still find myself going back to one simple, forgiving recipe. 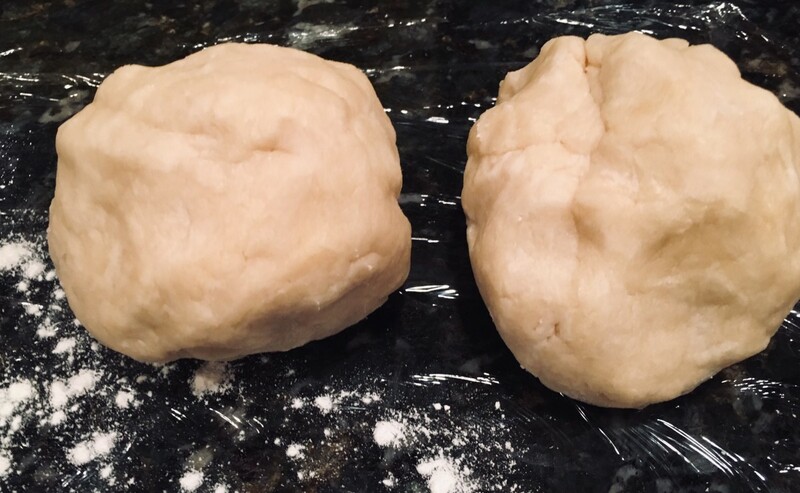 The great thing about this recipe is that even if I roll the dough out and it "comes apart," it's easy to fix: Simply piece the dough together like a puzzle; the inconsistencies will bake out. 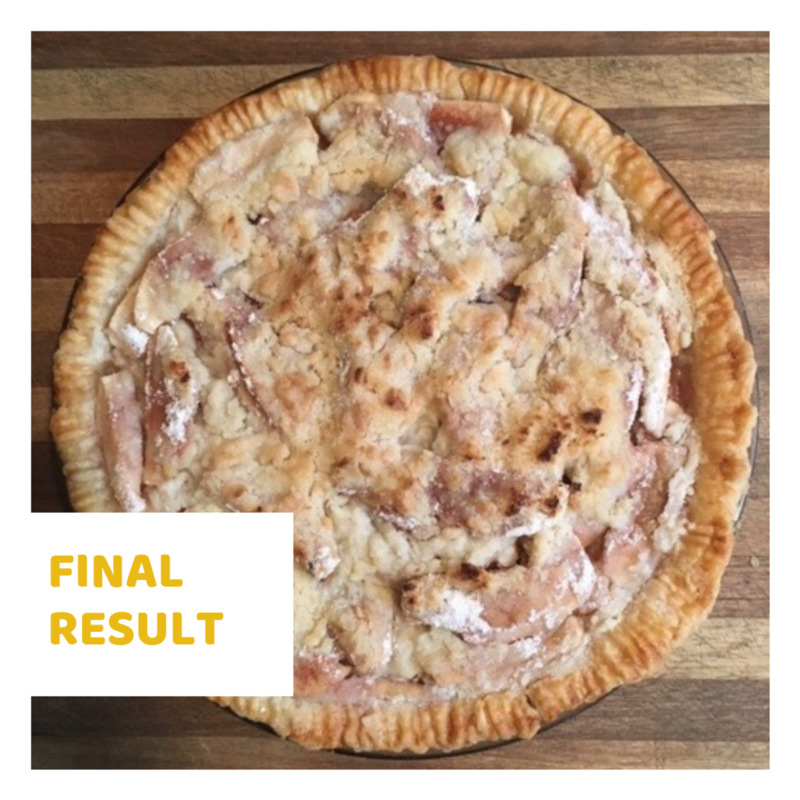 With this go-to recipe (easy, cheap ingredients, quick, consistent, good for beginners), my pies have been fail-proof for years. 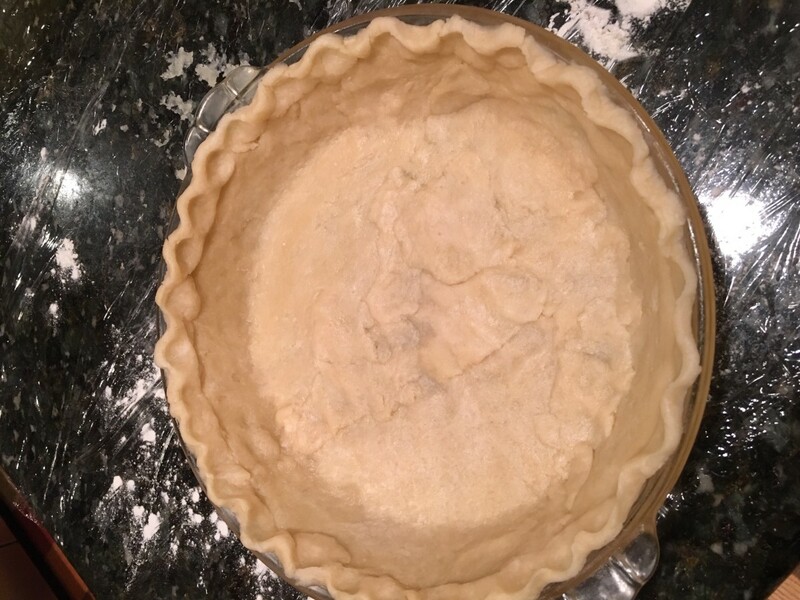 Here's a quick pie crust recipe that you can make in just minutes. The first crust I assembled using the "patchwork" technique. Good to use if having trouble transferring the dough. Why Use Vinegar in Pie? 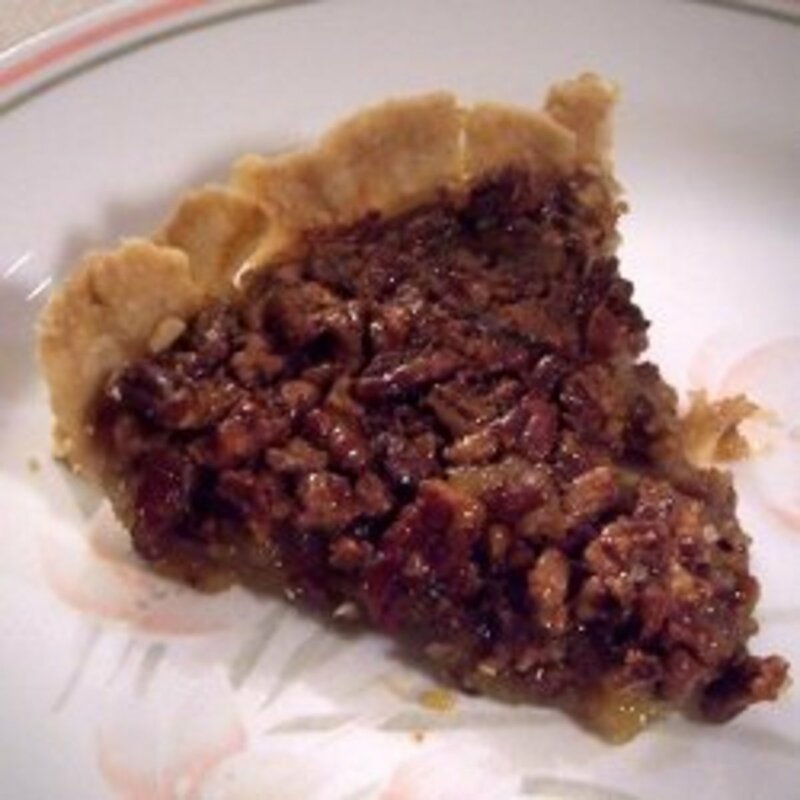 Vinegar inhibits gluten development and allows for a flakier crust. It acts as a tenderizier and makes the dough easier to work with. 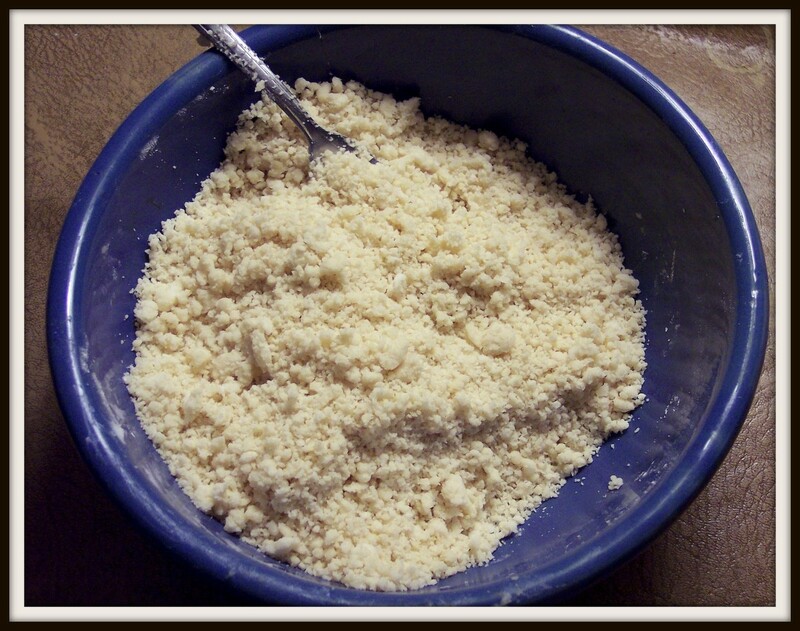 In a large bowl, add the flour and vegetable shortening. 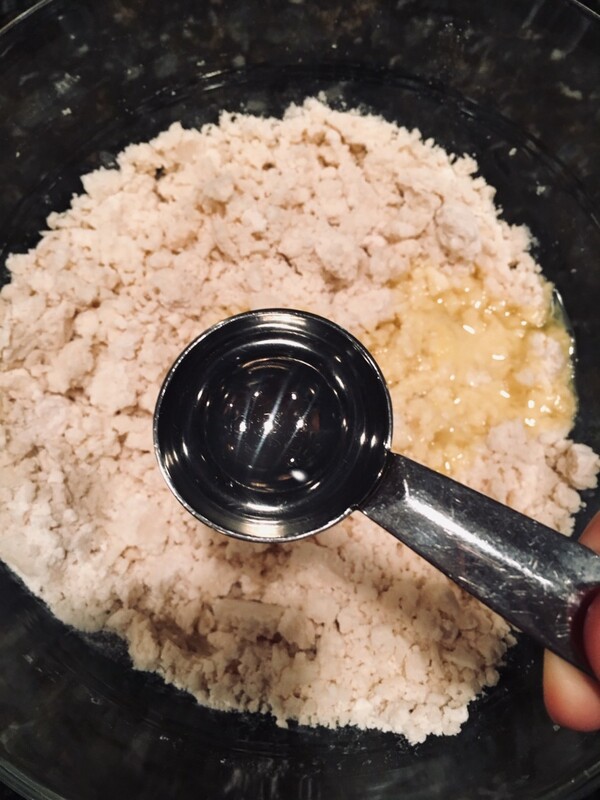 Use the pastry blender to cut the shortening into the flour. Do this for 2-4 minutes at a steady but gentle pace until crumbly. Crack the egg into a bowl and beat it. 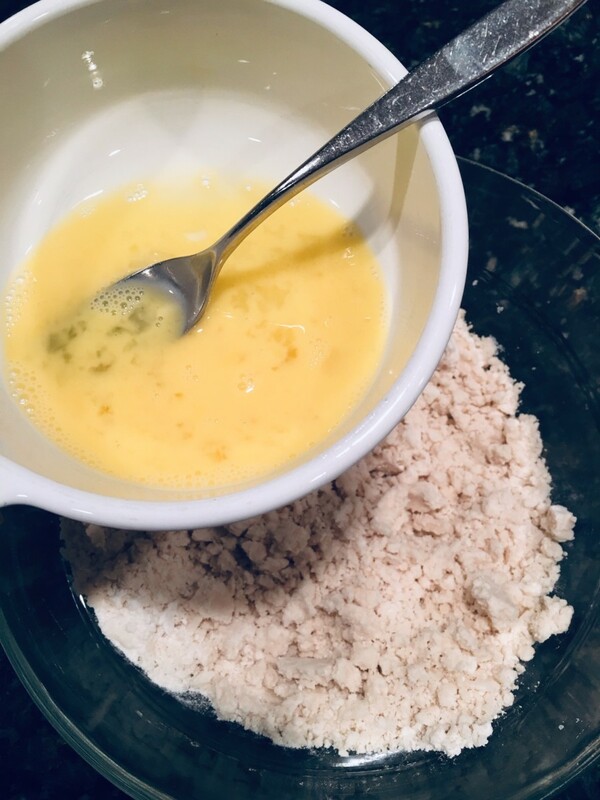 Pour the egg into the flour and shortening combination. Add the chilled water and white vinegar—sprinkle over the mixture. Use your hands to fold the wet ingredients into the dough. Press but do not work too roughly. Make sure all ingredients are well-incorpoated. 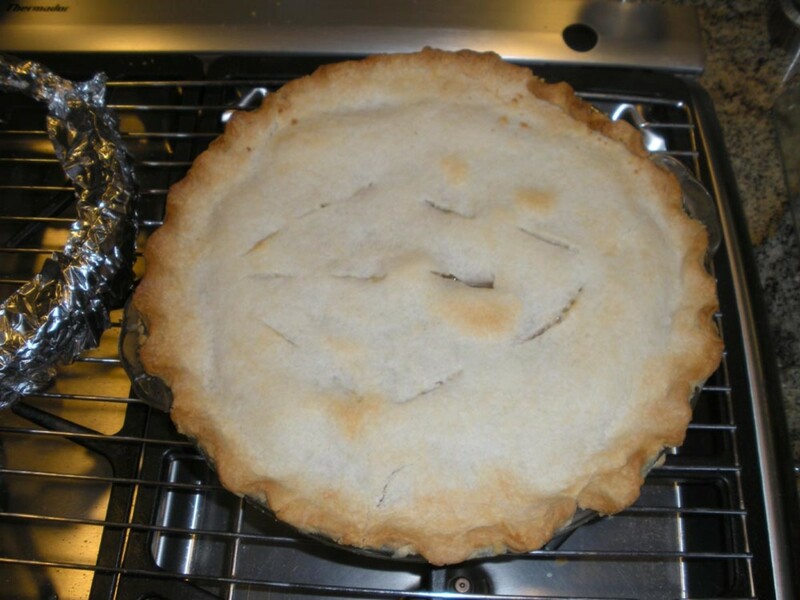 Separate the mass of dough in 1/2 (you can make 2 regular pie crusts or 3 thin with this amount). Store them in a plastic Ziploc bag and flatten them to around 1" thick. Story them in the freezer until needed or chill for 15 minutes and proceed to the next step. (I like to use plastic wrap or wax paper on my counter top for a clean rolling surface. If using wax paper, I generally secure it with tape and overlap the edges.) Once you have your rolling surface setup, sprinkle some flour on top. Place the ball of dough in the center and again, place another piece of wax paper on top. Proceed to roll with a rolling pin. Tip: Only roll from the center of the dough out, do not roll with a "back and forth motion"—this distrubs the dough. Once your dough has been rolled out, transfer it into the pie dish if you can. If you have trouble here, simple pick up large pieces and transfer it. 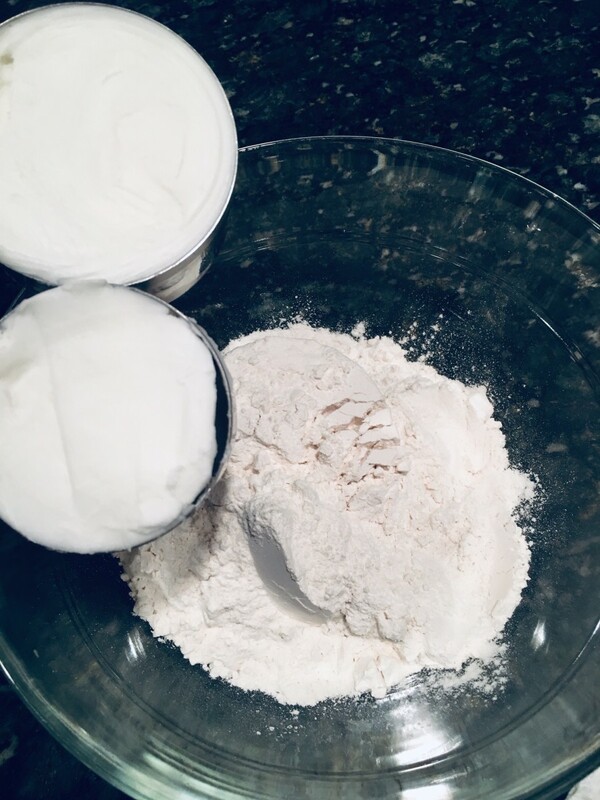 If your pie dough has been pieced together, simply press and gently blend the edges. 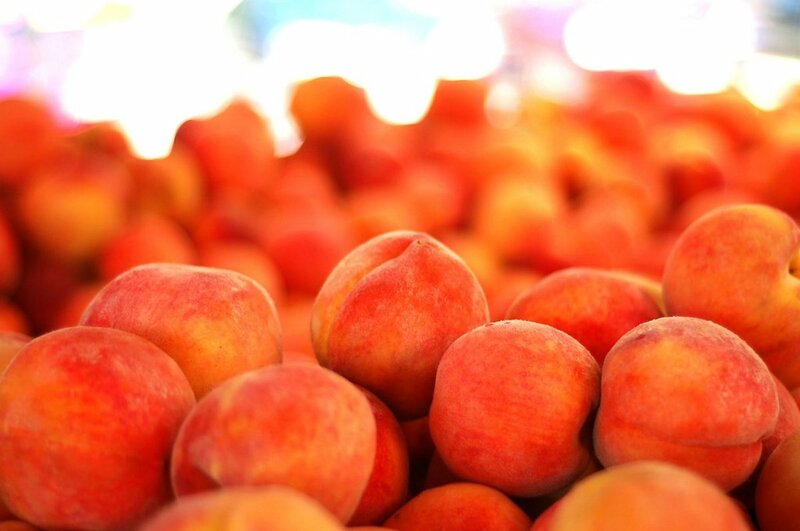 The blemishes will bake out. 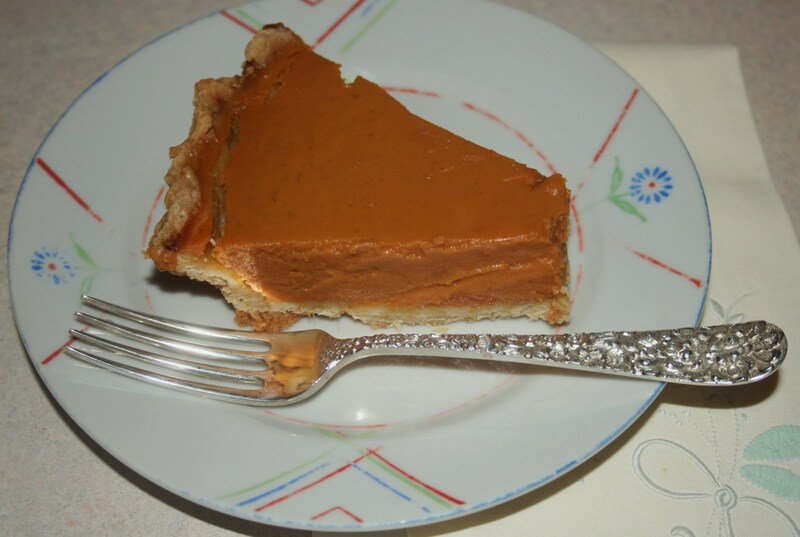 Use your two opposing thumbs to crimp the pie edge or use a fork for aesthetics. 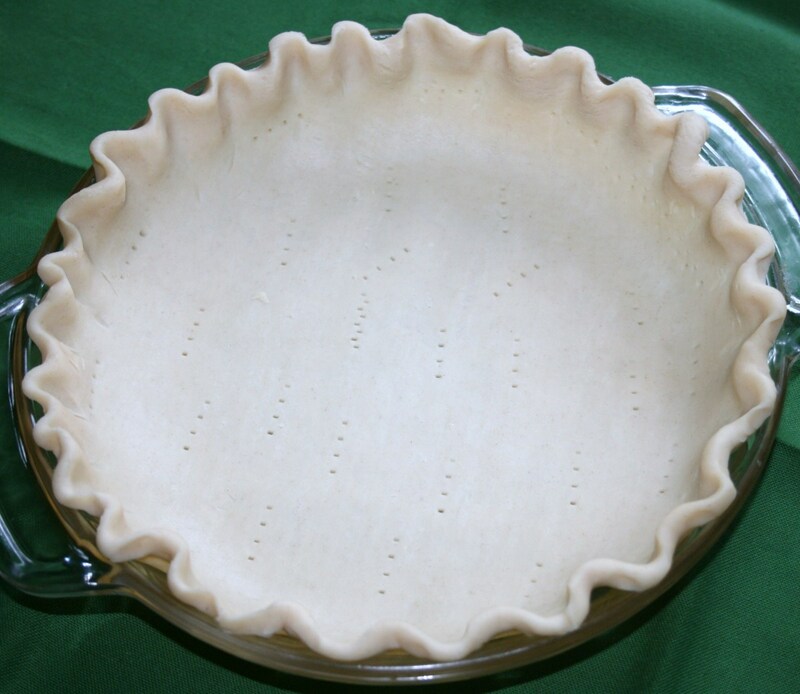 Finally, use a fork to poke holes in areas where there are air pockets (around the base edge of the pie dish) and sparsely throughout. 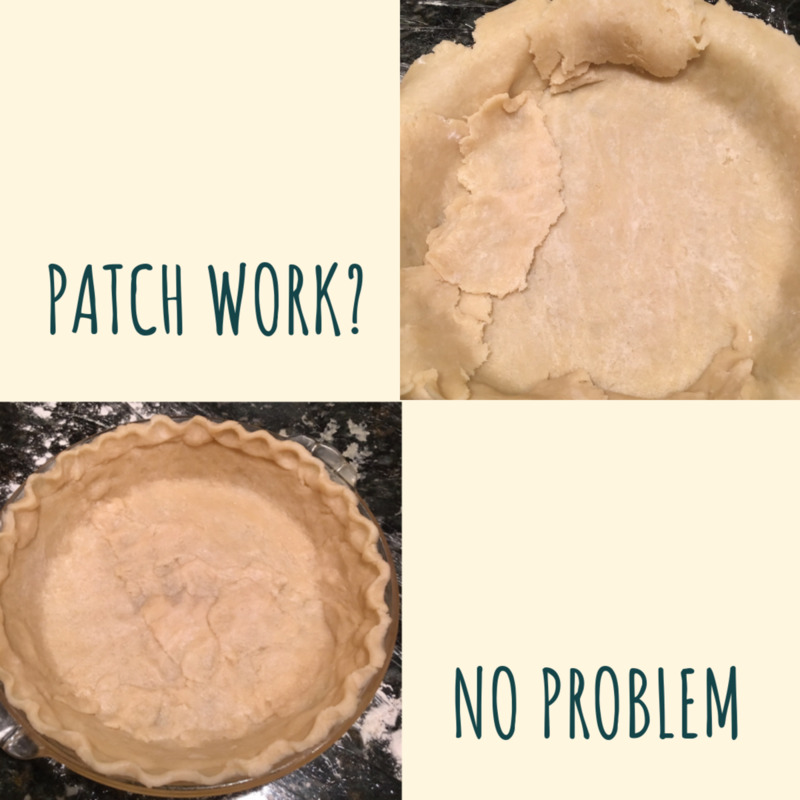 Patch work pie crust? No problem. The second crust I assembled using the "patchwork" technique. Good to use if having trouble transferring the dough. 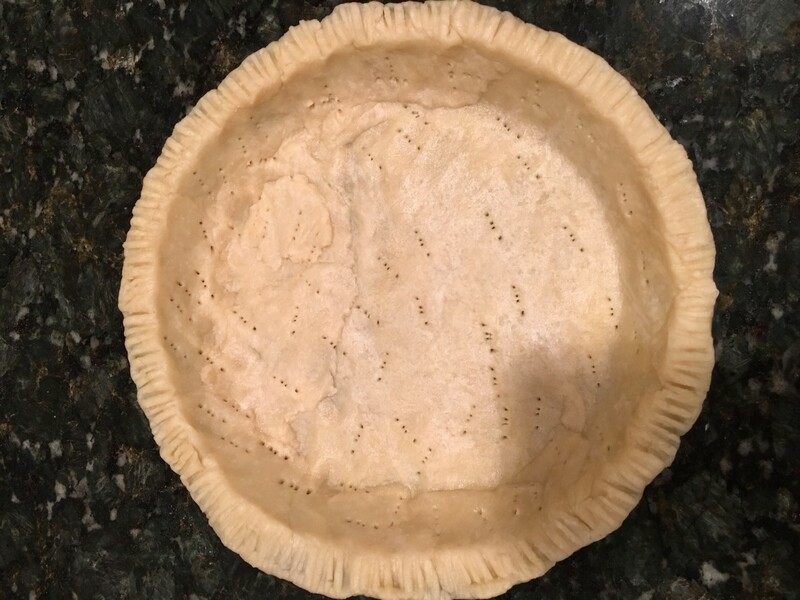 When I first started making pie, I couldn't afford a true electric blender (some bakers will pulse their pie crust), so I used to use two butter knives and cut my pie crust for 5-10 minutes. It was tiring! I finally purchased a cheap Betty Crocker pastry cutter, and ever since, making crust has been a breeze! Some individuals choose to simply use their hands, too. These methods are quite traditional. I really like interacting with the dough because it helps me better gauge when it is ready. I use this model of Cuisinart hand blender for my pie crusts. It's cheap—under $10 and is well-made. The grip is comfortable. You can easily find pie blenders at most locations. 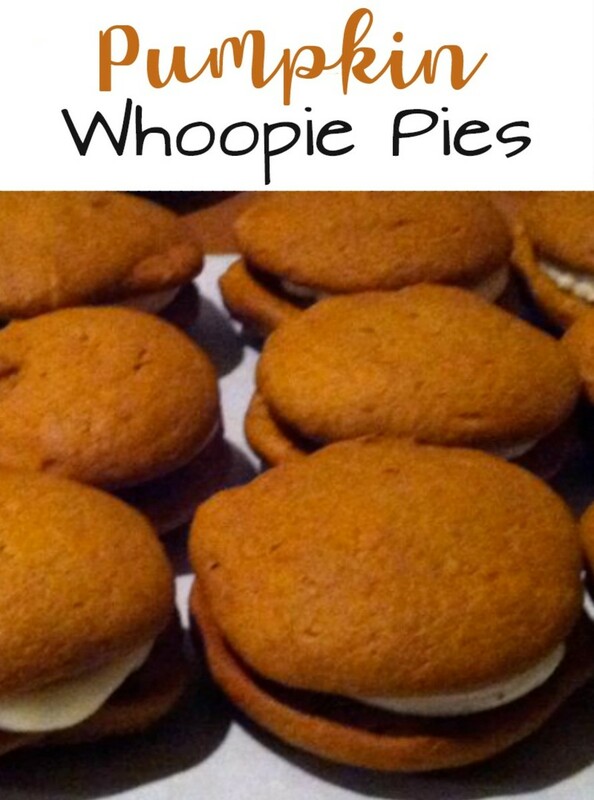 As mentioned, I found this recipe on Ree—The Pioneer Woman's website. I've used it for years. 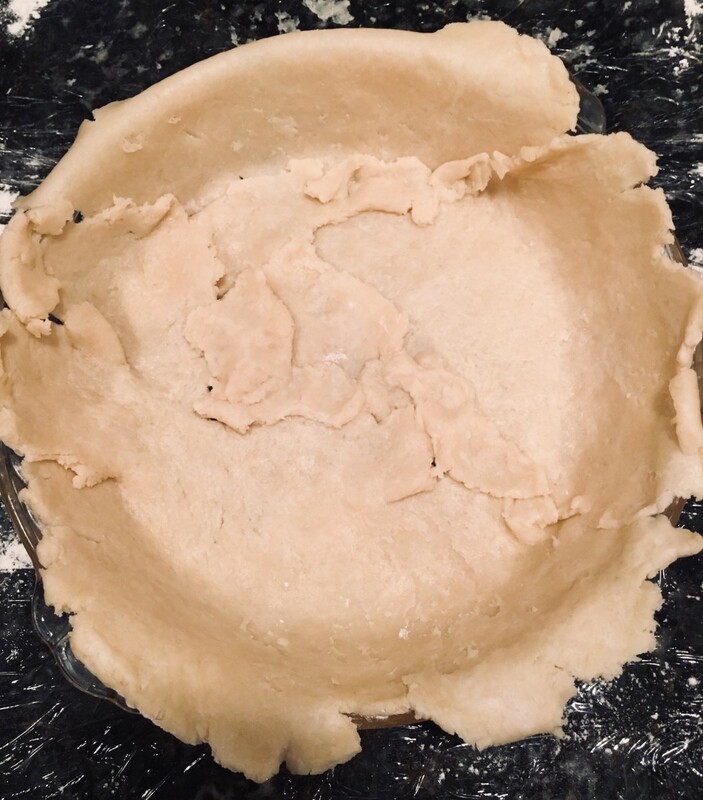 Of course, I hope to one day find a more natural, gluten-free pie crust recipe, but many of my family members really enjoy this crust. I make a French crumb with it with Granny Smith apples. Super easy—flour, butter, sugar, and cinnamon. It's delicious! MarleneB Totally! I love this recipe. It's fail-proof. I've used other inclusions but I really do like vinegar. Using a butter crust recipe with vodka (sub for vinegar) has worked well for me too, but seemed more appropriate for a quiche crust. Have fun! 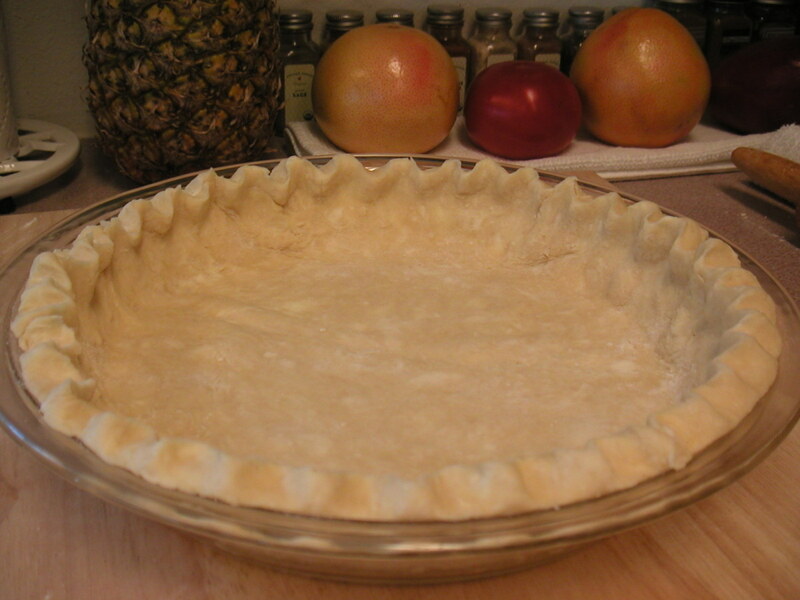 I have tried many recipes for pie crusts and have only had success making a pie crust once. Even then I do not know what I did to make it work. I have never tried using vinegar, but it makes perfect sense. I will try your recipe with confidence. 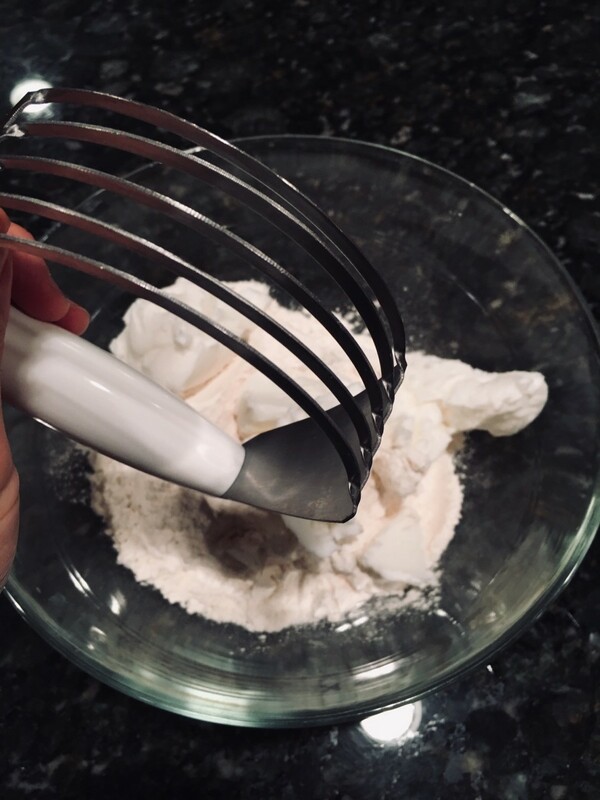 Oh, by the way, I have a pastry blender. I should use it!